Great stuff. I can't wait to read more. Wonderful to read, Ray! Love the story even if I have heard it before. Write more! Listen to Agnes! And if you haven't posted your Blog on Facebook, you might think about doing that. Hi Ray, I enjoyed reading your blog. Uncle Lou was a lovely man. I was very fond of him as a child. He was what i would call a sweet person. I look forward to more family stories Ray. That made me cry - thanks for sharing it with all of us. I of course knew that someone as fascinating, charming, genius, giving, funny, and everything else fabulous, had to have been from a wonderful family. I have always hated the word "blog" but such a pleasure to receive this so late at night and so early in my personal dance with words. Thanks for the promise of yet more joy to come. My goodness! I didn’t think I’d read this as I’m rasing with the clock myself today and I don't usually read blog suggestions that come in on my email. Since it was coming from you, Ray, I thought I'd give it a shot. It totallly held me. I was seeing the movie. in my mind. Damn Ray, this is wonderful storytelling. 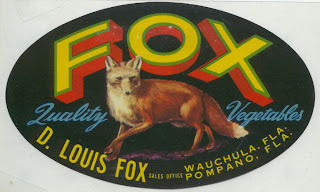 I knew the minute I saw the Fox Label that I was in for a treat. Never thought of you as a blogger--I've revised that idea. Most bloggs are so hard to read that I break my glasses trying to figure out why someone even tried. You're a blogger of different stripe. I predict you will soon have hundreds perhaps thousands of readers and I can't wait to read your account of your late friend Bashir. Thanks for inlcuding me. Publishers awake! This is just the beginning of Ray Errol Fox's wonderful stories and storytelling. I've heard, read and witnessed more and they would make a great book too. What an interesting life you seem to have led, Ray! And this, I would assume, is only the beginning, so keep us posted. Bet you'll that find blogging is shockingly addictive. great read, ray!!! you were always a wonderful storyteller... keep on posting!! Loved the story Ray, you now have to write that book, seriously NOW. I knew there was a reason I loved cucmbers and Ray Errol Fox stories. Keep it up. We need more. Well Ray, it was a pleasure to meet you a few weeks back, at the show that Mark and my mother Marta, et al put on. I couldn't think of better company to have had for dinner. It was even more a joy to come here and read your first blog post, it seems I have some catching up to do, but I look forward to the task. Entertaining and inspiring indeed. I am so glad you have pointed me in the direction of your blog. It is indeed a hidden gem! Your backstory is so touching, and I am proud to say I will stay tuned to the blog of the son of the cucumber king! Long may all we pickles live! I was very moved by this entry. I will read more of this blog. Wow. Who knew? An interesting and touching story, Ray...From today forward I will treat cucumbers with greater interest and respect!